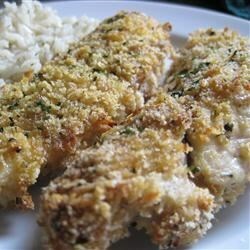 "Very tasty yogurt-dipped, breaded chicken breasts. The yogurt makes the chicken VERY moist and the coating nice and crunchy!" Place coated chicken in the baking dish and top each breast with a full pat of butter or margarine. Sprinkle with chopped parsley and bake in the preheated oven for 1 hour. Let cool for 5 to 10 minutes before serving.